arterial pressure (arterial blood pressure) blood pressure (def. 2). atmospheric pressure the pressure exerted by the atmosphere, usually considered as the downward pressure of air onto a unit of area of the earth's surface; the unit of pressure at sea level is one atmosphere. Pressure decreases with increasing altitude. 2. pressure of blood on walls of any blood vessel. capillary pressure the blood pressure in the capillaries. central venous pressure see central venous pressure. cerebral perfusion pressure the mean arterial pressure minus the intracranial pressure; a measure of the adequacy of cerebral blood flow. cerebrospinal pressure the pressure of the cerebrospinal fluid, normally 100 to 150 mm Hg. continuous positive airway pressure see continuous positive airway pressure. filling pressure see mean circulatory filling pressure. intracranial pressure see intracranial pressure. intraocular pressure the pressure exerted against the outer coats by the contents of the eyeball. intrapleural pressure (intrathoracic pressure) pleural pressure. intrinsic positive end-expiratory pressure elevated positive end-expiratory pressure and dynamic pulmonary hyperinflation caused by insufficient expiratory time or a limitation on expiratory flow. It cannot be routinely measured by a ventilator's pressure monitoring system but is measurable only using an expiratory hold maneuver done by the clinician. Its presence increases the work needed to trigger the ventilator, causes errors in the calculation of pulmonary compliance, may cause hemodynamic compromise, and complicates interpretation of hemodynamic measurements. Called also auto-PEEP and intrinsic PEEP. maximal expiratory pressure maximum expiratory pressure. maximal inspiratory pressure the pressure during inhalation against a completely occluded airway; used to evaluate inspiratory respiratory muscle strength and readiness for weaning from mechanical ventilation. A maximum inspiratory pressure above −25 cm H2O is associated with successful weaning. maximum expiratory pressure (MEP) a measure of the strength of respiratory muscles, obtained by having the patient exhale as strongly as possible against a mouthpiece; the maximum value is near total lung capacity. maximum inspiratory pressure (MIP) the inspiratory pressure generated against a completely occluded airway; used to evaluate inspiratory respiratory muscle strength and readiness for weaning from mechanical ventilation. A maximum inspiratory pressure above −25 cm H2O is associated with successful weaning. mean airway pressure the average pressure generated during the respiratory cycle. mean circulatory filling pressure a measure of the average (arterial and venous) pressure necessary to cause filling of the circulation with blood; it varies with blood volume and is directly proportional to the rate of venous return and thus to cardiac output. negative pressure pressure less than that of the atmosphere. oncotic pressure the osmotic pressure of a colloid in solution. osmotic pressure the pressure required to stop osmosis through a semipermeable membrane between a solution and pure solvent; it is proportional to the osmolality of the solution. Symbol π.
partial pressure the pressure exerted by each of the constituents of a mixture of gases. peak pressure in mechanical ventilation, the highest pressure that occurs during inhalation. plateau pressure in mechanical ventilation, the pressure measured at the proximal airway during an end-inspiratory pause; a reflection of alveolar pressure. pleural pressure the pressure between the visceral pleura and the thoracic pleura in the pleural cavity. Called also intrapleural or intrathoracic pressure. positive pressure pressure greater than that of the atmosphere. positive end-expiratory pressure (PEEP) a method of control mode ventilation in which positive pressure is maintained during expiration to increase the volume of gas remaining in the lungs at the end of expiration, thus reducing the shunting of blood through the lungs and improving gas exchange. A PEEP higher than the critical closing pressure prevents alveolar collapse and can markedly improve the arterial Po2 in patients with a lowered functional residual capacity, as in acute respiratory failure. Effects of the application of positive end-expiratory pressure (PEEP) on the alveoli. A, Atelectatic alveoli before PEEP application. B, Optimal PEEP application has reinflated alveoli to normal volume. C, Excessive PEEP application overdistends the alveoli and compresses adjacent pulmonary capillaries, creating dead space with its attendant hypercapnia. From Pierce, 1995.
pulmonary artery wedge pressure (PAWP) (pulmonary capillary wedge pressure (PCWP)) intravascular pressure, reflecting the left ventricular end diastolic pressure, measured by a swan-ganz catheter wedged into a small pulmonary artery to block the flow from behind. pulse pressure the difference between the systolic and diastolic pressures. If the systolic pressure is 120 mm Hg and the diastolic pressure is 80 mm Hg, the pulse pressure is 40 mm Hg; the normal pulse pressure is between 30 and 40 mm Hg. urethral pressure the pressure inwards exerted by the walls of the urethra, which must be counteracted in order for urine to flow through; see also urethral pressure profile. venous pressure the blood pressure in the veins; see also central venous pressure. water vapor pressure the tension exerted by water vapor molecules, 47 mm Hg at normal body temperature. wedge pressure blood pressure measured by a small catheter wedged into a vessel, occluding it; see also pulmonary capillary wedge pressure and wedged hepatic vein pressure. wedged hepatic vein pressure the venous pressure measured with a catheter wedged into the hepatic vein. The difference between wedged and free hepatic vein pressures is used to locate the site of obstruction in portal hypertension; it is elevated in that due to cirrhosis, but low in cardiac ascites or portal vein thrombosis. The tension exerted on the walls of arteries by: the strength of the contraction of the heart; the resistance of arterioles and capillaries; the elasticity of blood vessels; the blood volume; and blood viscosity. Low blood pressure is sometimes present in healthy individuals, but it indicates shock in patients with fever, active bleeding, allergic reactions, active heart disease, spinal cord injuries, or trauma. Blood pressure should be checked routinely whenever a patient sees a health care provider because controlling abnormally high blood pressure effectively prevents damage to the heart and circulatory system as well as the kidneys, retina, brain, and other organs. Elevated blood pressures should first be addressed by giving advice to patients about lifestyle modifications, such as limiting the intake of alcohol, following a diet approved by the American Heart Association, and increasing the level of physical exercise. Weight loss in obese patients is also advisable. Medications are added to lifestyle instructions most of the time. Antihypertensive medications are used according to evidence-based guidelines and the side effects these drugs may cause in particular patients. Diuretics, for example, are esp. helpful in blacks and elderly patients (but may be inadvisable in patients with gout); beta blockers are the drugs of choice in patients with a history of myocardial infarction (but would be contraindicated in patients with advanced heart block); alpha blockers are well suited for men with prostatic hypertrophy; and angiotensin-converting enzyme inhibitors prevent kidney disease in patients with diabetes mellitus. Other antihypertensive drug classes include the angiotensin II receptor antagonists, centrally active alpha antagonists, and calcium channel blockers. Low blood pressure is not treated in healthy patients; in patients with acute illnesses, it is often corrected with hydration or pressor agents. An increase in diastolic pressure, usually by an artificial device, such as an intra-aortic balloon pump. Blood pressure in the heart chambers, in a great vein, or close to the heart. If determined in a vein, it is termed central venous pressure; if in the aorta or a similar large artery close to the heart, it is designated central arterial pressure. A condition in which the systolic blood pressure is consistently less than 100 mm Hg. In the absence of associated disease, low blood pressure is often a predictor of longevity and continued health. The blood pressure when the ventricles of the heart are filling with blood. In health this equals about 60 to 80 mm Hg. Determination of the blood pressure within the lumen of an artery or within a chamber of the heart with a catheter introduced into the organ and attached to a pressure-monitoring transducer. It is done by placing a sterile needle or small catheter inside an artery and having the blood pressure transmitted through that system to a suitable recorder. As the blood pressure fluctuates, the changes are recorded graphically. A simple external method for measuring blood pressure. Palpation method: The same arm, usually the right, should be used each time the pressure is measured. The arm should be raised to heart level if the patient is sitting, or kept parallel to the body if the patient is recumbent. The patient's arm should be relaxed and supported in a resting position. Exertion during the examination could result in a higher blood pressure reading. Either a mercury-gravity or aneroid-manometer type of blood pressure apparatus may be used. The blood compression cuff should be the width and length appropriate for the size of the subject's arm: narrow (2.5 to 6 cm) for infants and children and wide (13 cm) for adults. The inflatable bag encased in the cuff should be 20% wider than one third the circumference of the limb used. The deflated cuff is placed evenly and snugly around the upper arm so that its lower edge is about 1 in above the point of the brachial artery where the bell of the electronic sensor will be applied. While feeling the radial pulse, inflate the cuff until the pressure is about 30 mm above the point where the radial pulse was no longer felt. Deflate the cuff slowly and record as accurately as possible the pressure at which the pulse returns to the radial artery. Systolic blood pressure is determined by this method; diastolic blood pressure cannot be determined by this method. This method is used for both continuous and intermittent readings, and while it formerly was used primarily in ICUs, it now is used routinely by nursing assistants on units throughout health care agencies and in clinics and physicians' offices. Measuring blood pressure at the wrist is more comfortable than a conventional BP cuff because it derives readings without pumping a bladder full of air, and with accuracy rivaling direct measurement from an arterial catheter. The sensor is placed directly over the radial artery and connected to an electronic monitor. Pressure is monitored every 15 heartbeats and systolic, diastolic, mean arterial pressure, waveforms, and pulse rate are displayed. The first reading appears in 15 seconds, and the sensor measures pressures from 40 to 240 mm Hg, with preset alarms to alert the nurse to extreme highs and lows. Results are not affected by low cardiac output, arrhythmias, hypothermia, or obesity, and this method is being used increasingly on adults in hospital special care units where frequent serial readings are required. Auscultatory method: Begin as above. After inflating the cuff until the pressure is about 30 mm above the point where the radial pulse disappears, place the bell of the stethoscope over the brachial artery just below the blood pressure cuff. Then deflate the cuff slowly, about 2 to 3 mm Hg per heartbeat. The first sound heard from the artery is recorded as the systolic pressure. 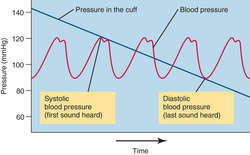 The point at which sounds are no longer heard is recorded as the diastolic pressure. For convenience the blood pressure is recorded as figures separated by a slash. The systolic value is recorded first. Sounds heard over the brachial artery change in quality at some point prior to the point the sounds disappear. Some physicians consider this the diastolic pressure. This value should be noted when recording the blood pressure by placing it between the systolic pressure and the pressure noted when the sound disappears. Thus, 120/90/80 indicates a systolic pressure of 120 with a first diastolic sound change at a pressure of 90 and a final diastolic pressure of 80. The latter pressure is the point of disappearance of all sounds from the artery. When the values are so recorded, the physician may use either of the last two figures as the diastolic pressure. When the change in sound and the disappearance of all sound coincide, the result should be written as follows: 120/80/80. The sum of twice the diastolic blood pressure plus the systolic blood pressure, all divided by 3. Blood pressure that is less than atmospheric pressure, as in the great veins near the heart. A blood pressure between 100 and 120 mm Hg systolic and < 80 mm Hg diastolic. Blood pressure during contraction of the ventricles. It is normally 100 to 120 mm Hg. Higher systolic blood pressures are found in prehypertension and hypertension. Q. What Is the Treatment for Hypertension? I have a slightly elevated blood pressure. What is the initial possible treatment? Q. Does Ameal BP lower high blood pressure? A. The answer is, CURRENTLY, not. Milk proteins (the class that Ameal BP belongs to) do lower blood pressure in lab studies, but trials in humans have shown mixed results. You should remember that it may interfere with other drugs you may take, so first consult your doctor if it's safe for you. You may try it and see if it works or not. Q. What Are the Complications of High Blood Pressure? My wife suffers from high blood pressure. What are the possible complications that are so dangerous? Why is it important to keep high blood pressure under balance? A. While elevated blood pressure alone is not an illness, it often requires treatment due to its short and long-term effects on many organs. The risk is increased for: Cerebrovascular accident (CVAs or strokes), myocardial infarction (heart attack), hypertensive cardiomyopathy (heart failure due to chronically high blood pressure),hypertensive retinopathy - damage to the retina, hypertensive nephropathy- chronic renal failure due to chronically high blood pressure and hypertensive encephalopathy- confusion, headache and convulsions due to edema in brain that can lead to death. Therefore, it is considered very important to reduce blood pressure to normal levels with strict medical supervision. Dr Dai Lloyd AM said: "It is vitally important that we raise awareness of the effects of high blood pressure, and initiatives such as these undertaken at both a national and global level are vital in meeting that aim. In fact, nearly one-third of people who have high blood pressure don't know it. Heather added: "For most pregnant women, they won't know they have high blood pressure until they fall ill or have their first midwife appointment. When a cause has been identified, treatment for high blood pressure is directed at the cause. In addition, this study reinforces guidelines backed by the American Heart Association and other professional organizations that recommend reducing salt consumption to minimize the risk of developing high blood pressure," Forman said. The reason high blood pressure is called "the silent killer" is that it causes no discomfort in early stages said the head of the Cyprus Cardiology Society, Petros Agathaggelou. But if this pressure rises and stays high over time, it's called high blood pressure, and it can damage your body in many ways. Most people with high blood pressure have no signs or symptoms at all. Know how many of your patients have high blood pressure and high cholesterol, what proportion are controlled, and what can be done to help more patients get these conditions under control, he said. Consistently high blood pressure forces the heart to work far beyond its capacity. The prevalence of control of high blood pressure was 29% among adults without health insurance, and control of high cholesterol was less than 15% among those with limited access to health care. High blood pressure in pregnancy can be dangerous and is linked to the condition preeclampsia.